With the glorious weather in the Bay Area right now, and the dwindling days of June, I thought it perfect timing to share this unbelievable June wedding in Brazil! 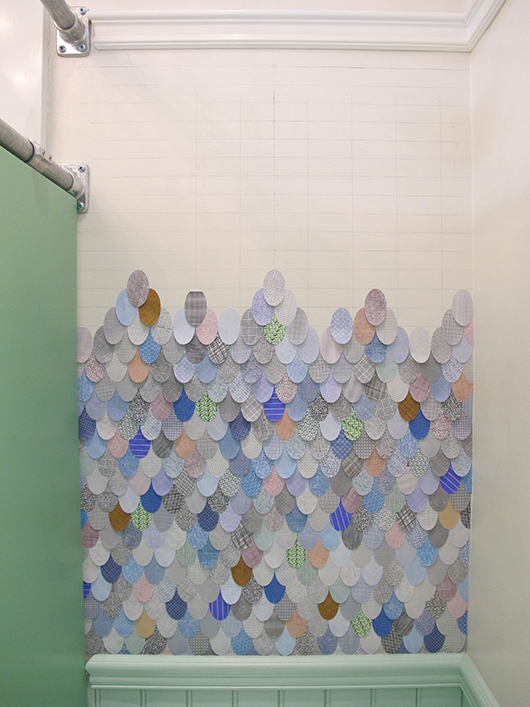 This project is, by far, one of my favorite projects of all time. Mariana and Saul were an absolute dream to work with. Mariana, originally from Rio de Janeiro (where the wedding was to take place), had so much inspiration for me to draw from; photographs and wonderful stories. The process of working so closely with her was very special, I almost feel as if I’ve been to Rio! 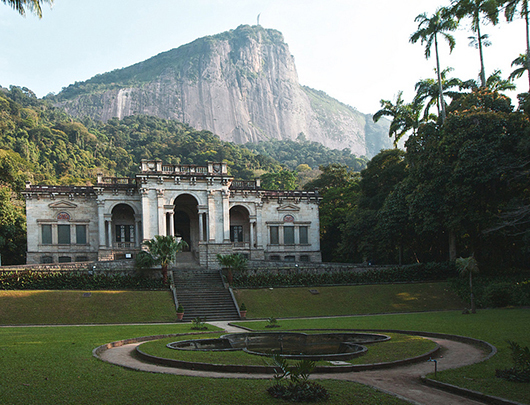 The inspiration for the invitations was based on Parque Lage as this was where the wedding would take place! This magnificent mansion, built in 1849, was originally the home of Henrique Lage and his wife, Gabriela Bezanzoni (an Italian opera singer). This open interior courtyard, shown above, has two facing balconies that had been specifically designed for Gabriella’s performances. Nowadays, it is the home of the Visual Arts School and it’s surrounding gardens and subtropical forest lands are open to the public. I think it is the most powerful and magical wedding venue I have ever seen! 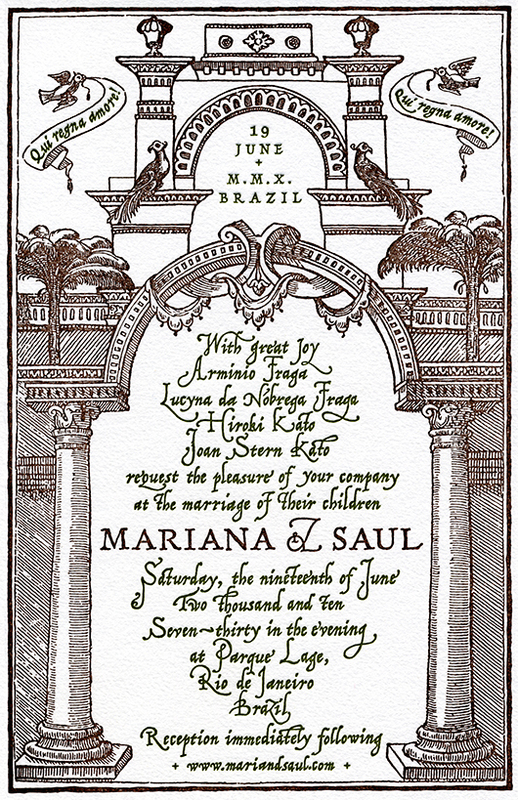 The illustration I created for the invitation was inspired by the architecture of this mansion along with decorative bookplates/title-pages from the 1500-1700s. I designed the response card with the same look and feel but my illustrations focused instead on the surrounding romantic gardens and fountains at Parque Lage. I love how the spray of water from the fountain becomes the line to fill in your name. 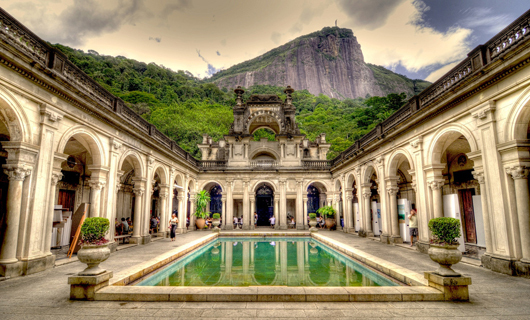 Another wonderful view of Parque Lage. 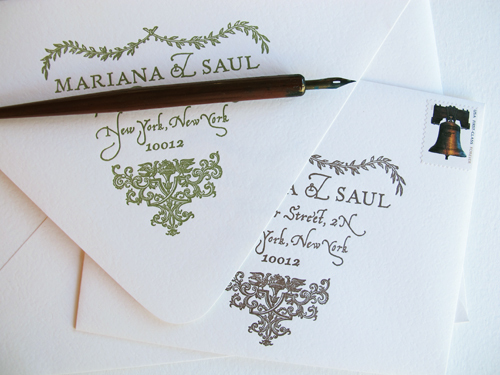 I printed my design for the return address in both olive green and espresso brown to complement the suite. 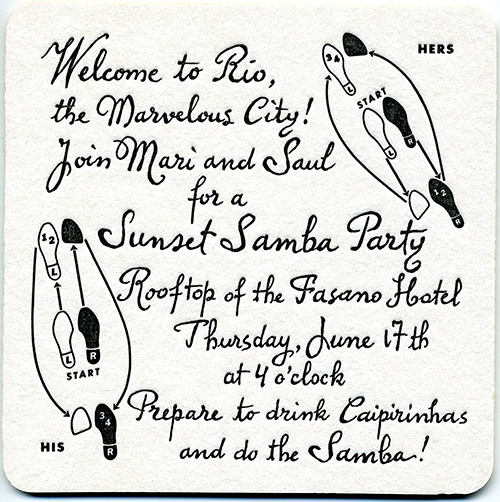 Mariana and Saul threw a Sunset Samba Party to welcome their guests to Rio. The party took place on the rooftop of a beautiful hotel overlooking the city. They served Brazilian barbeque and Caipirinha cocktails and had professional dancers both performing and teaching the basic Samba steps. 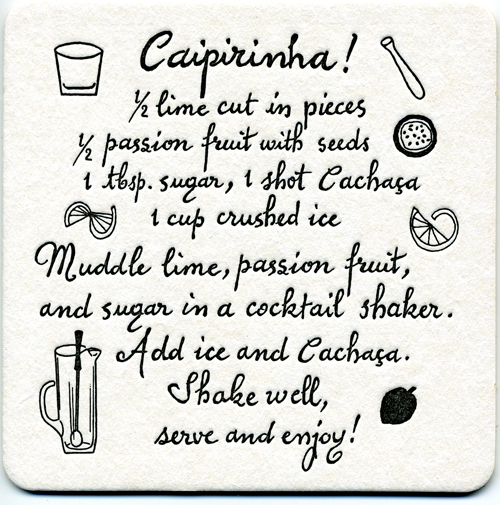 Mariana wanted this invitation to be playful and fun with her personal favorite Caipirinha recipe on the back… for this reason I thought it would be great to print the invitation on a drink coaster! I also found an old dance book from the 60s that had ‘his’ and ‘her’ instructional Samba steps, perfect. 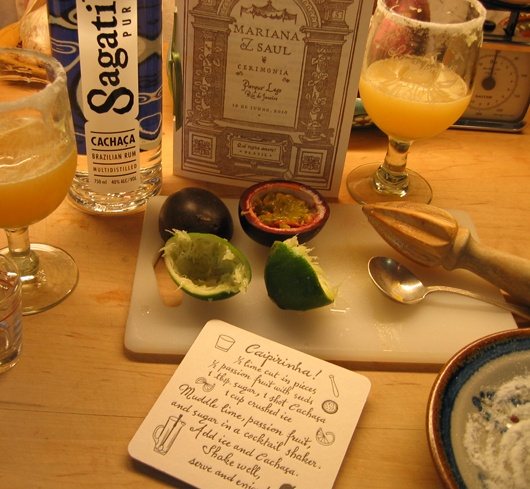 Here is the back side with Mariana’s recipe, the addition of passion fruit is her signature touch… delicious. The next evening, they threw a rehearsal dinner at a famous club, Rio Scenarium, in the old city. Again, Mariana wanted this invitation to be fun and personal. 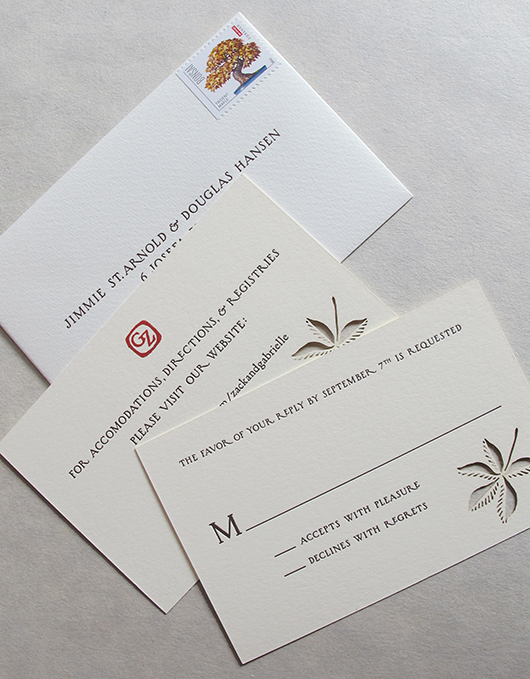 We decided to make the invitation a handwritten-looking postcard. 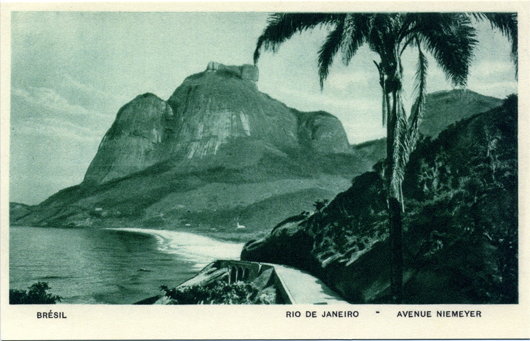 I found a few vintage Brazilian postcards and Mariana was especially drawn to this image (above) of Pedra da Gavea as it held great significance to her family. I made the back side look like a hand-written note sent from Mariana and Saul. 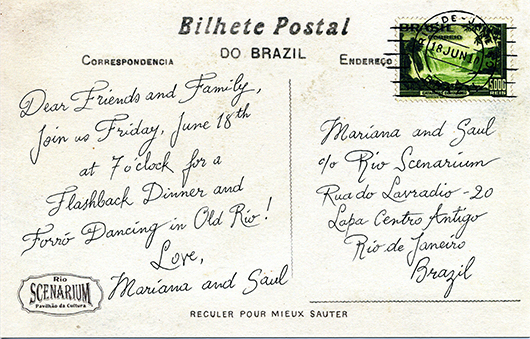 I added fun touches like the Scenarium logo, a gorgeous Brazilian postage stamp, and a hand-drawn postmark with the date of the event. Mariana also had some wonderful sayings that she asked me to integrate into the designs; the one above “reculer pour mieux sauter” is a French saying roughly translating to “take a step back before you make the big leap”… perfect sentiment for a “flashback dinner” on the eve of your wedding day. In the end, there were approximately 600 guests who attended this magnificent event! Really quite unbelievable. 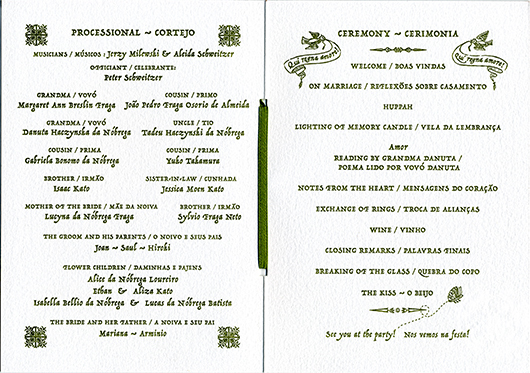 There were no printed menus or seating cards but I was able to create a lovely wedding program. 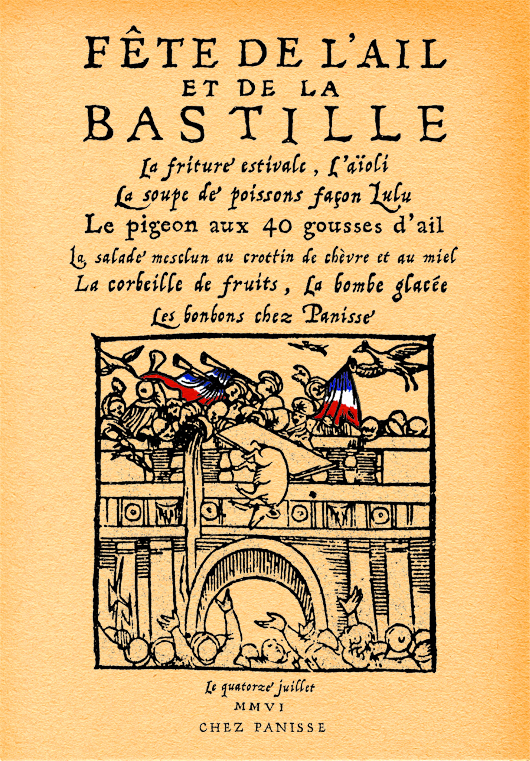 Again, I looked to the architecture of Parque Lage and vintage title pages as inspiration for the illustrations. 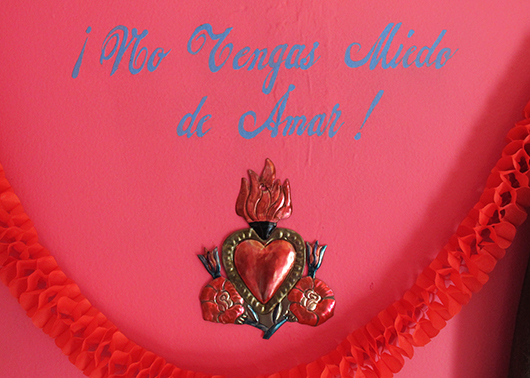 I added personal touches like their initials, a “huppa” in the archway (Saul is Jewish and they were to be married under a traditional huppa), and another of Mariana’s sayings “Qui regna amore!” = Love reigns here! Here is the inside spread of the wedding program. 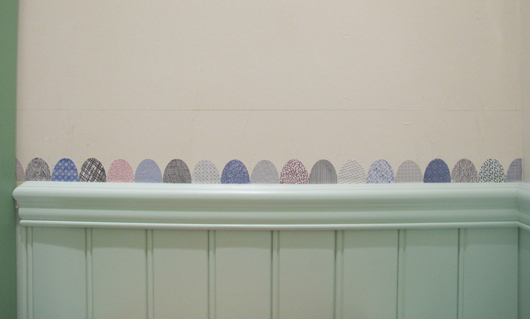 I created the graphic pattern in the corners to echo the actual pattern of the handmade lace for their huppa. I loved writing in both English and Portuguese. 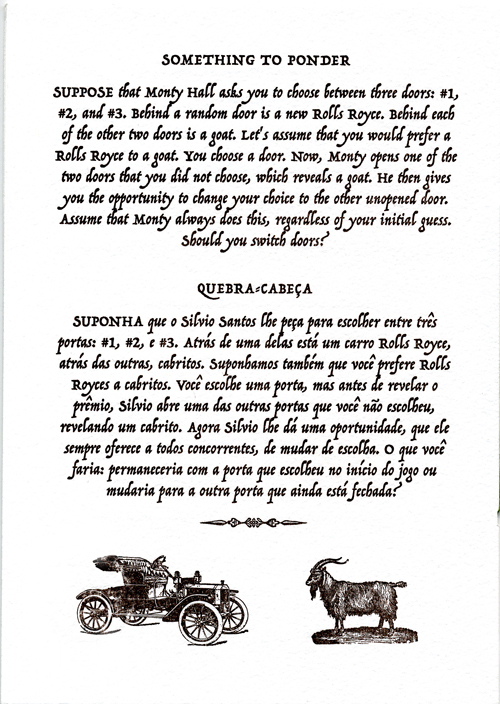 Saul had the creative idea of adding a riddle to the back page of the program, a little something to amuse the guests while they waited for the bride to walk down the aisle. Both Saul and Mariana were pursuing their PhD’s at Columbia University so it seemed quite fitting for Saul to request adding a little mind game ….. I still don’t know the correct answer! 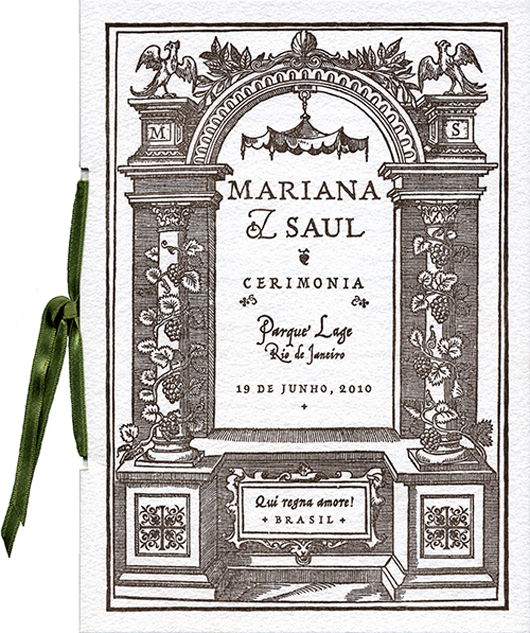 After completing such a special project, Mariana and Saul generously invited me to attend their wedding! Unfortunately I was unable able to go due to previous work commitments, so sad. However, on the night of their wedding my boyfriend and I made Mariana’s Caipirinhas, played Brazilian music, and made a toast to Mari and Saul. It wasn’t Rio but it was delicious. With May Day just a few days ago, I feel like I’ve been hearing mention of maypoles everywhere. Fittingly, it has inspired me to create this post about a very special outdoor wedding in Mendocino, California. Andie, the bride, was such a delight to work with. She had wonderful ideas, lots of inspiration, and a fun and playful spirit. I was so inspired by her thoughtful descriptions of what she envisioned for her wedding day… a whimsical garden wedding with vintage (circa 1915) English country fair decor, the venue – a quaint inn overlooking the ocean, a tent decorated with tissue pom-poms and bunting, garlands and flags, yellow and white old fashioned flowers (cottage roses, daffodils, peonies) displayed in old tarnished mismatched silver teapots, the entire wedding party dressed in period-appropriate vintage-inspired attire with Andie wearing a mantilla style antique lace veil, a family style feast in the pasture for the reception, ducks and chickens roaming the lawns, …. and a maypole! 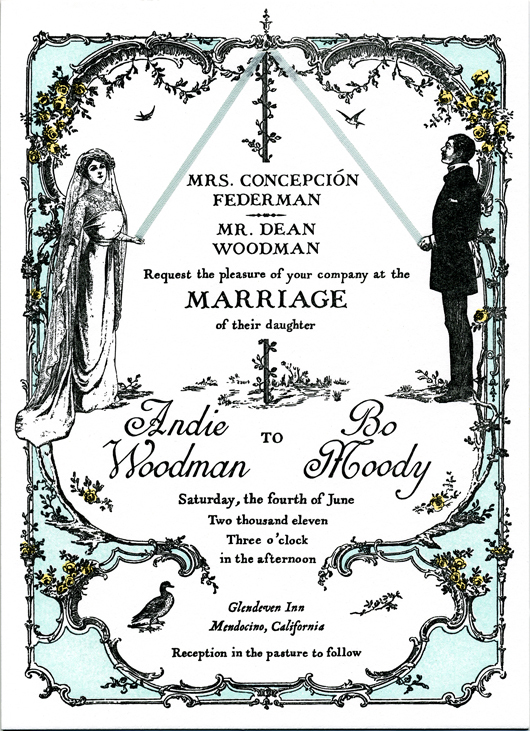 (Or as Andie put it “er… Junepole, I guess, technically speaking”…as their wedding day was the 4th of June). 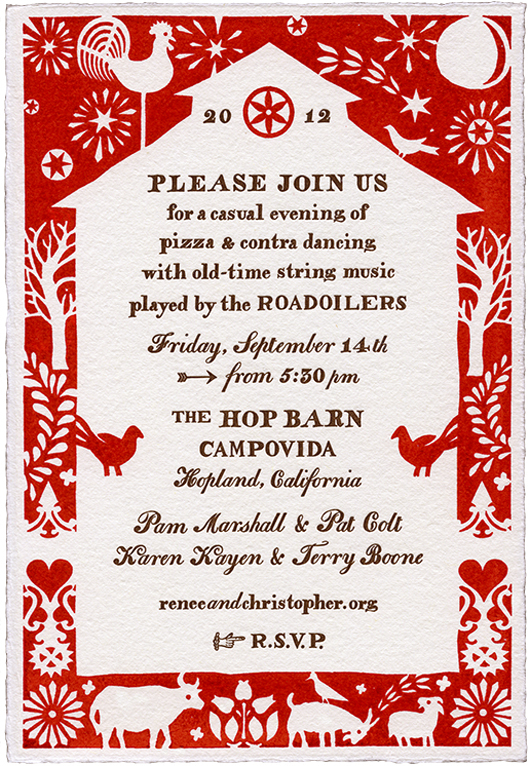 The moment I heard it, I knew I wanted to incorporate the image of a maypole into the invitation design. I love how the two strands of silk ribbon join the bride and groom (in 1915 appropriate dress!) 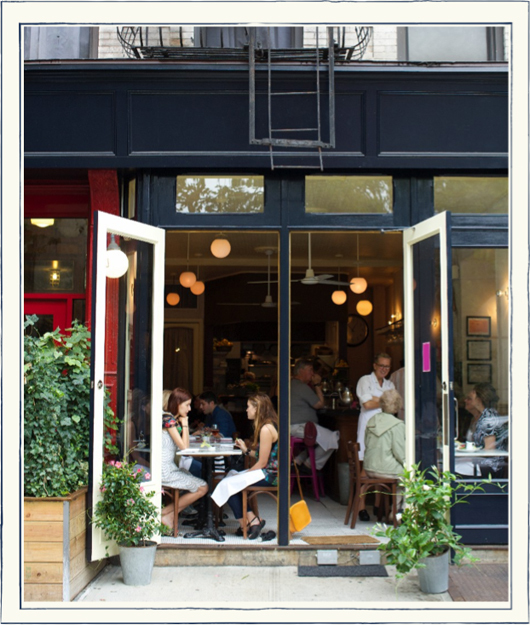 and create a canopy over the invitation wording. The colors that Andie chose for her wedding really added to the whole look as well: buttercup yellow and white florals, pale robin’s egg blue and an accent of black and white stripes (like grosgrain striped ribbon). 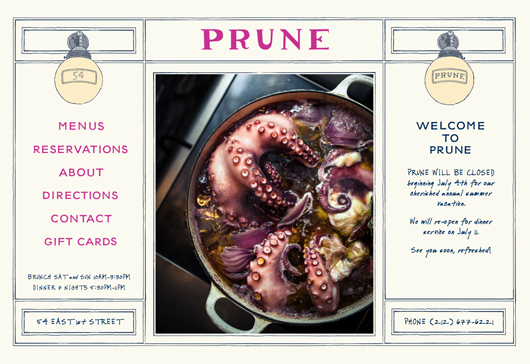 She wanted the invitation to be “old fashioned, elegant & stately but not overly perfect… with an element of whimsey”, a description of a dream project for me! 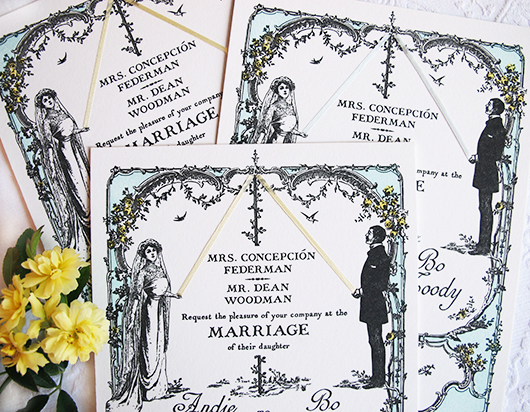 I silkscreen printed the yellow cottage roses and robin’s egg blue and letterpress printed in black. 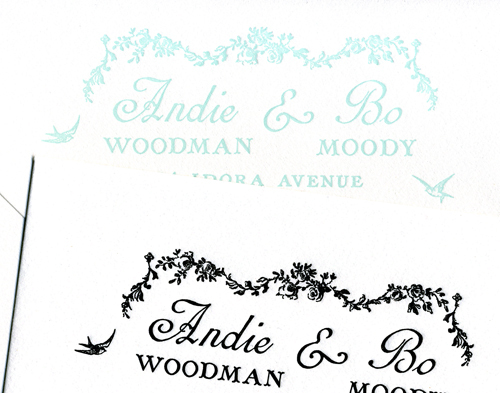 I then wove the silk ribbon onto the invitations, doing some in pale yellow, the other half in pale blue. And here is the sweet hand-drawn map I created. 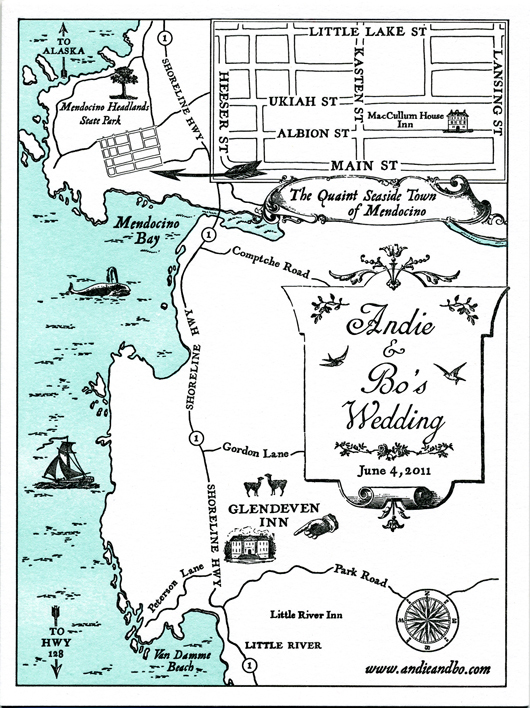 Most of the guests were staying in the town of Mendocino and being escorted by shuttle to the wedding venue, Glendeven Inn. The property of Glendeven is surrounded by beautiful pastures, holds a llama farm, has chickens, guinea fowl, ducks (and sometimes wild turkeys!) roaming the land, and an organic vegetable garden…. just perfect for a country fair themed wedding, don’t you agree? 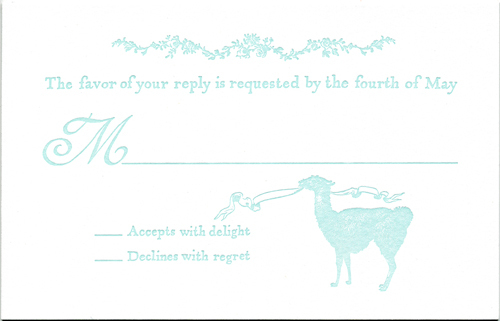 With Andie’s lovely sense of humor, we just had to put a llama on the rsvp card. 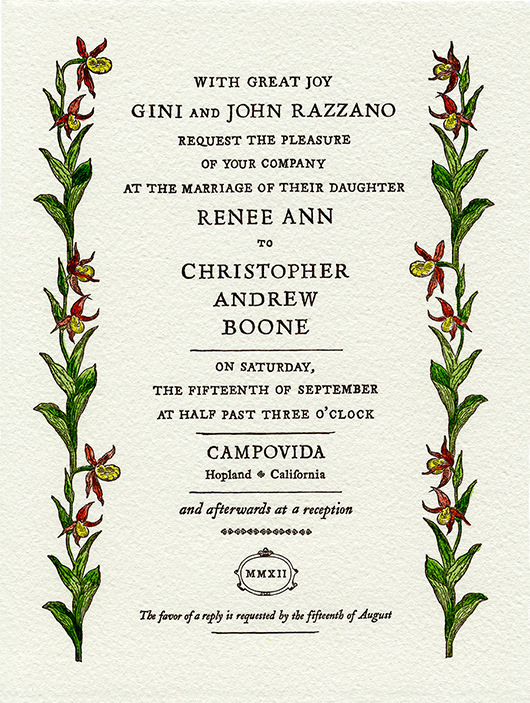 The return address design for the envelopes was kept simple and elegant with swallows and garlands of roses. And here is an example of what the envelopes looked like. 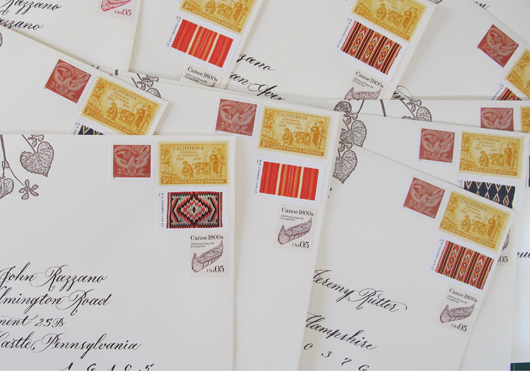 Andie selected the most beautiful vintage stamps, such perfect colors. 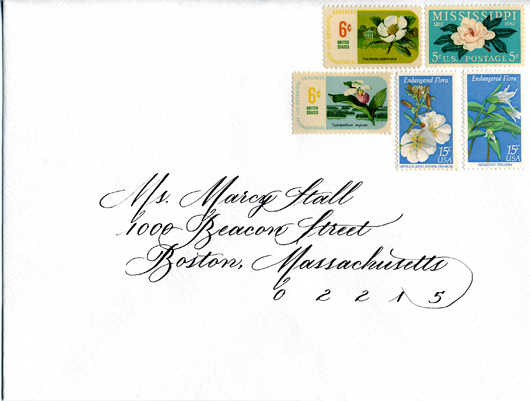 The gorgeous calligraphy of the addresses was done by Adrienne Keats. 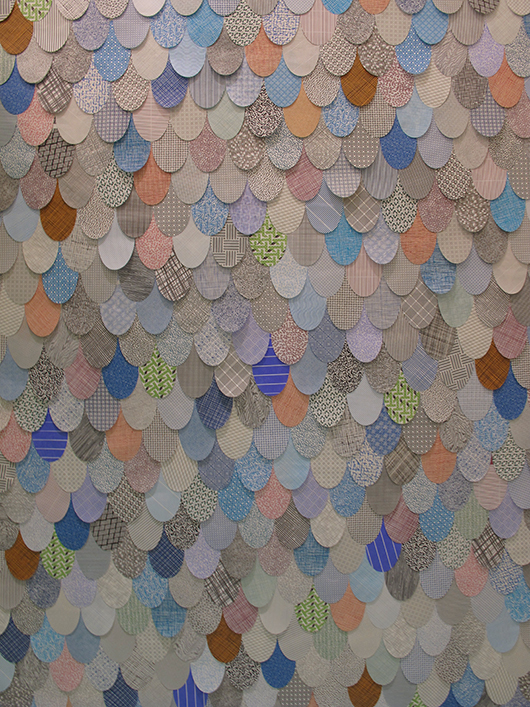 Andie had wanted a particular style captured, “elegant but with some element of whimsey and eccentricity”…. Adrienne’s execution was perfect. 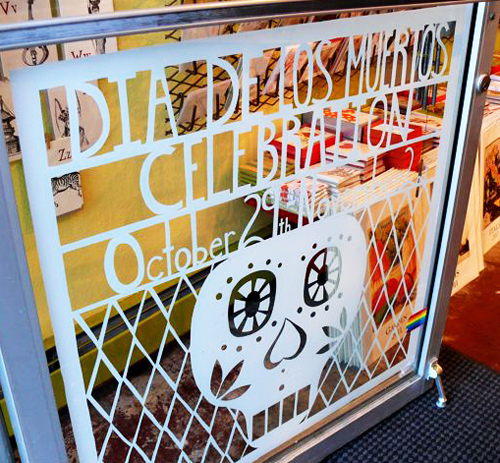 As a perfect follow up to my previous post on Day of the Dead, I thought I’d share a fun project that I did as a surprise for Two Hands Paperie. 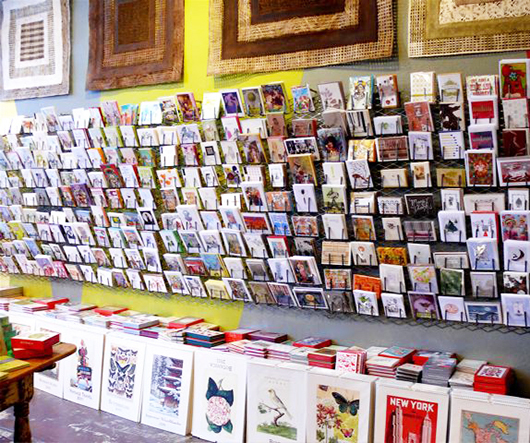 This gorgeous store is in historic downtown Boulder, Colorado and it is owned by one of my dearest friends, Mia Semingson, and her husband Gerald Trainor. 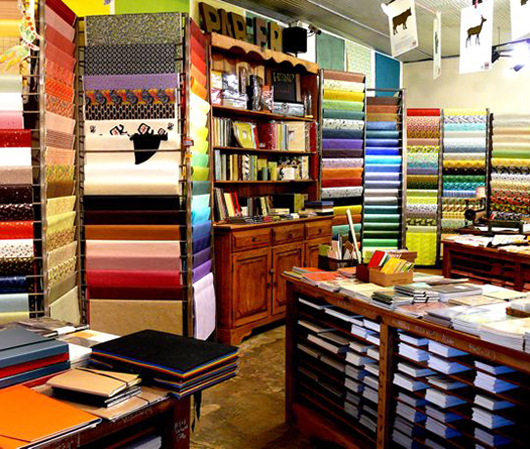 Two Hands Paperie is such a magical place, full to the brim with decorative papers, journals, fine pens, cards, stationary, art supplies, books…. the list goes on and on! 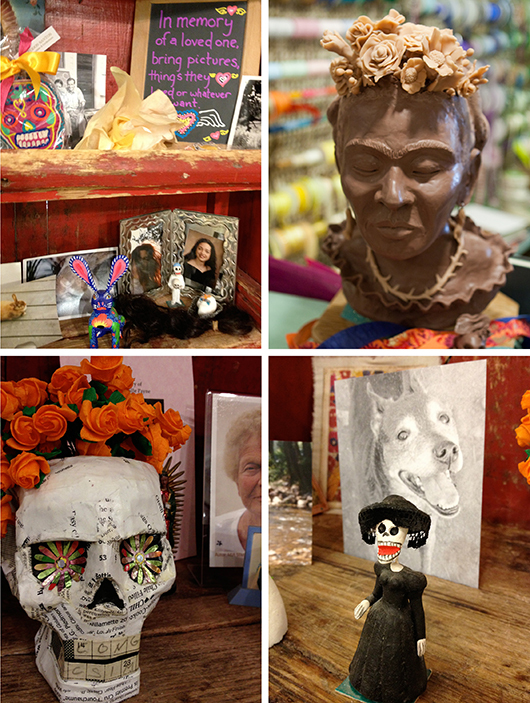 Day of the Dead in the store. 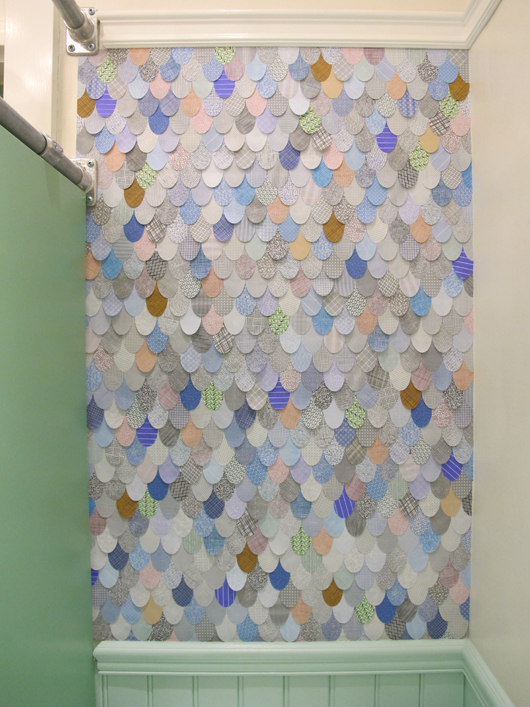 Here is a wonderful decorative sign on the front door made out of contact paper! Every year Mia builds a beautiful altar in the store and encourages anyone and everyone to contribute to it. 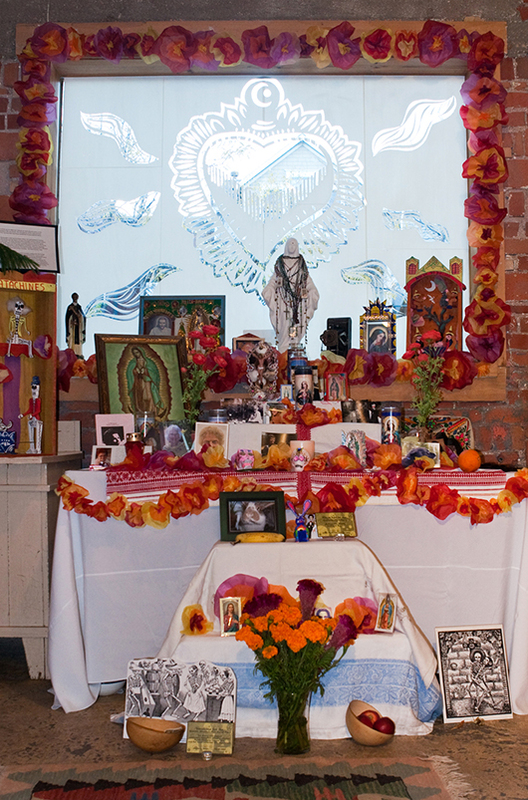 You can see another fantastic design, cut out of contact paper, on the window behind the shrine. 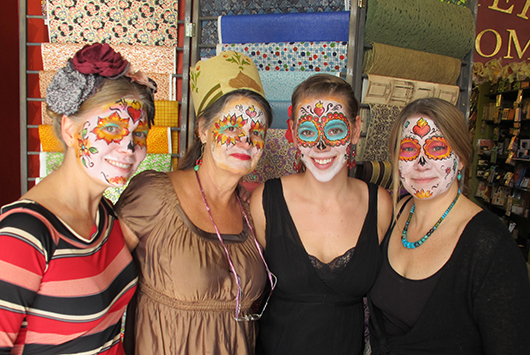 And here are the beautiful women of Two Hands Paperie in true celebratory spirit! Mia, on the far left, has started a wonderful tradition of having everyone’s faces painted for the occasion. The very talented Jessica Quintanilla does the amazing face painting. I so wish I lived closer so I could join in the fun! 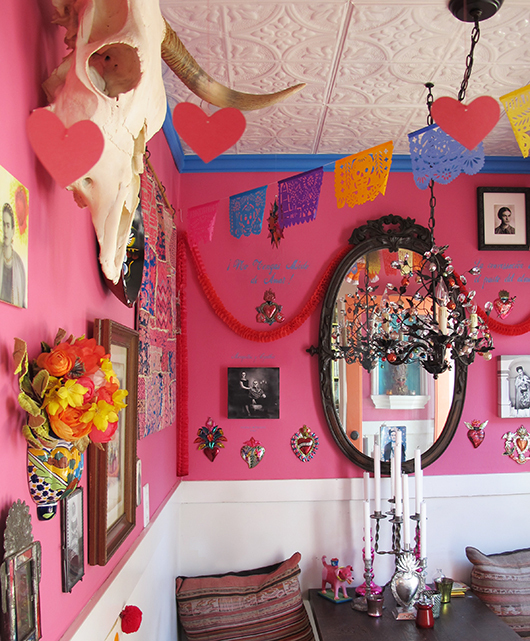 I’ve always wanted to go and visit Mia for Day of the Dead, this year I was determined to at least be there in spirit. 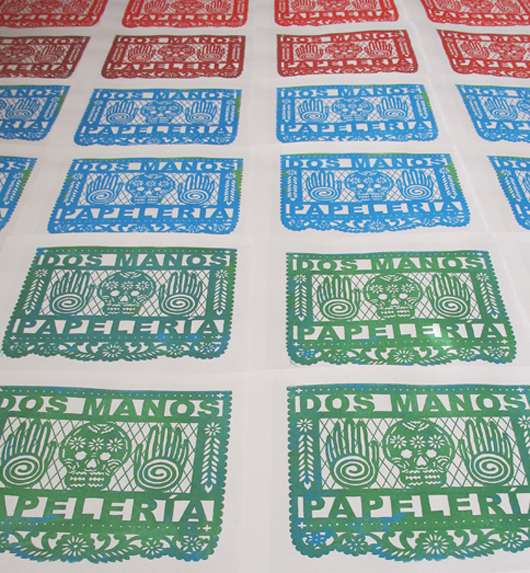 I created this papel picado design as a festive surprise for the store. I had fun incorporating her logo (the two hands). 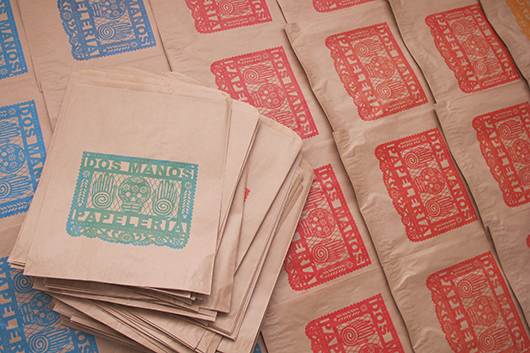 I silkscreen printed banners to decorate the store and merchandise bags to give out to customers. The bags were too large and flimsy to fit in my drying racks so I had to spread them out on every inch of my studio floor to dry, they looked so beautiful! 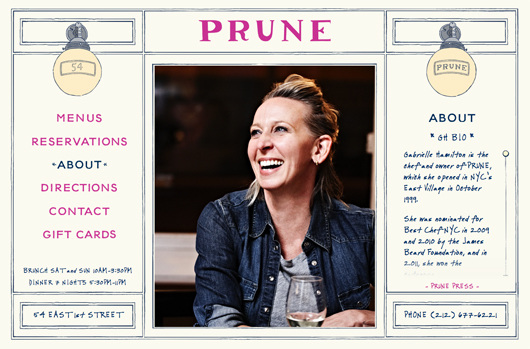 Here’s a lovely promotional piece that Mia put together for the store. 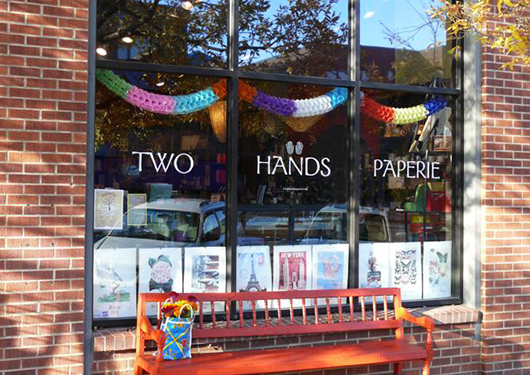 So, if you find yourself near Boulder, Two Hands Paperie is really worth a visit…. 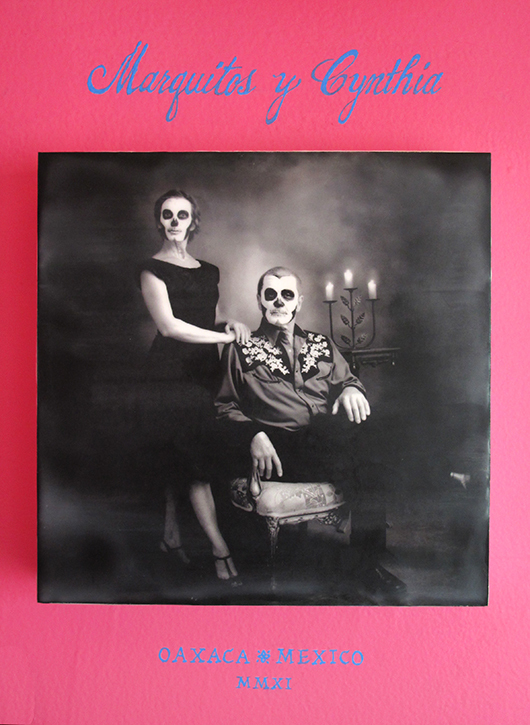 for Day of the Dead or anytime of year. 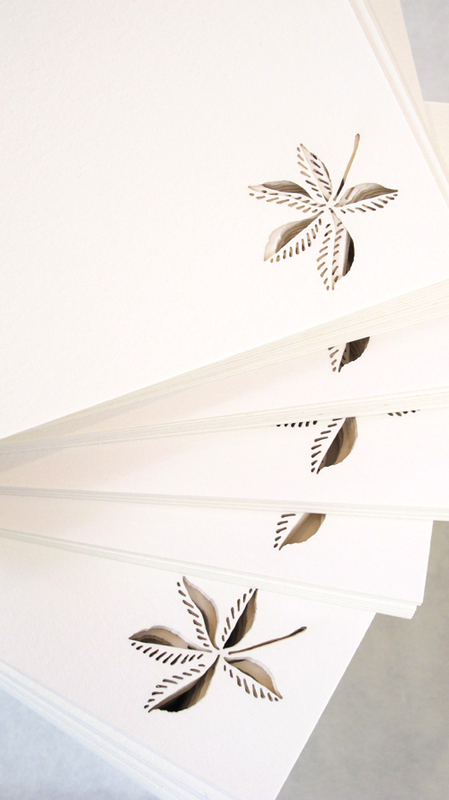 I recently completed a custom wedding invitation suite that incorporated laser cutting! 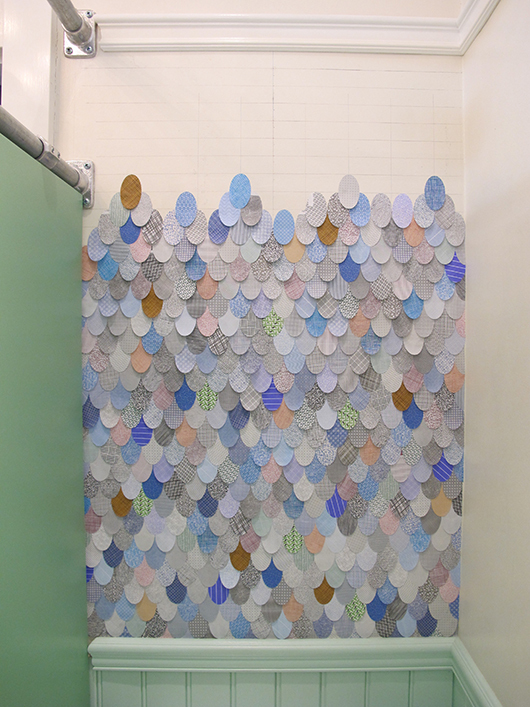 I’ve been completely intrigued by laser cutting ever since my trip to New York for the National Stationary Show in May. 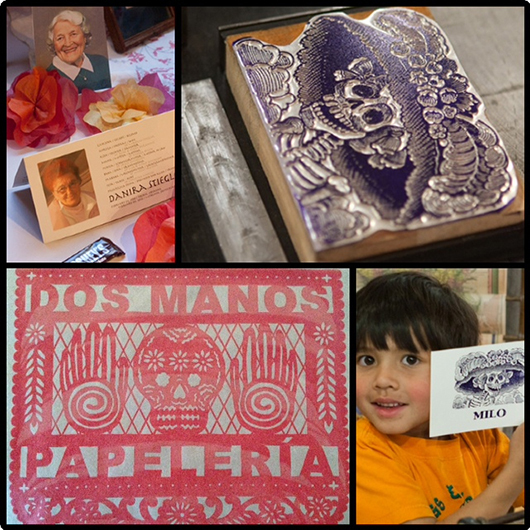 There were several vendors at the show who specialized in laser cutting and all the samples I saw were very impressive. 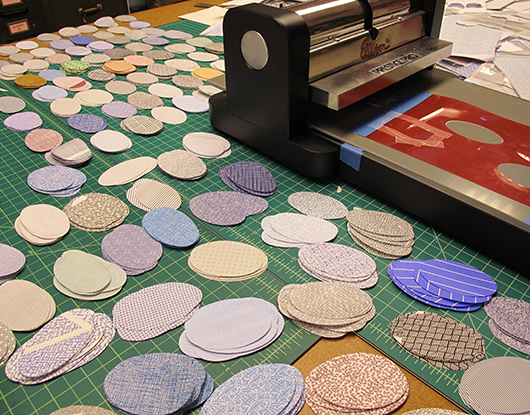 However, there was one vendor that really struck me, Scott Vogel of Papel Couture, based in Columbus Ohio. 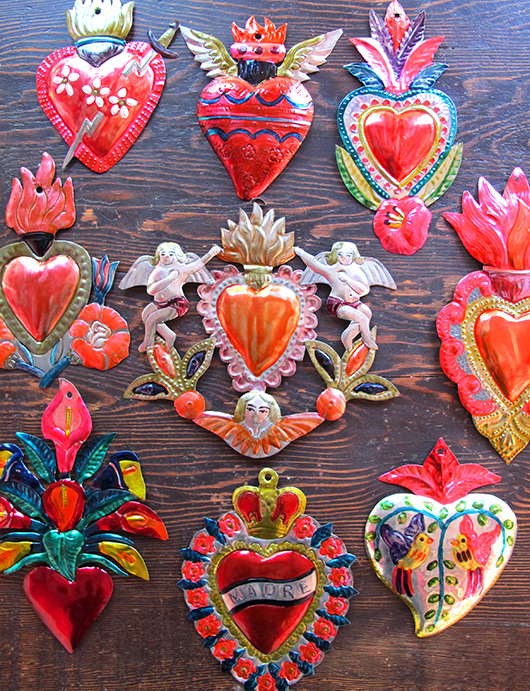 I was first drawn in by their gorgeous booth, decorated with very large intricately cut wall hanging pieces, but after speaking with Scott I knew I was truly hooked. I returned home to the Bay Area with Scott’s card and various samples eager to include the technique on one of my projects. 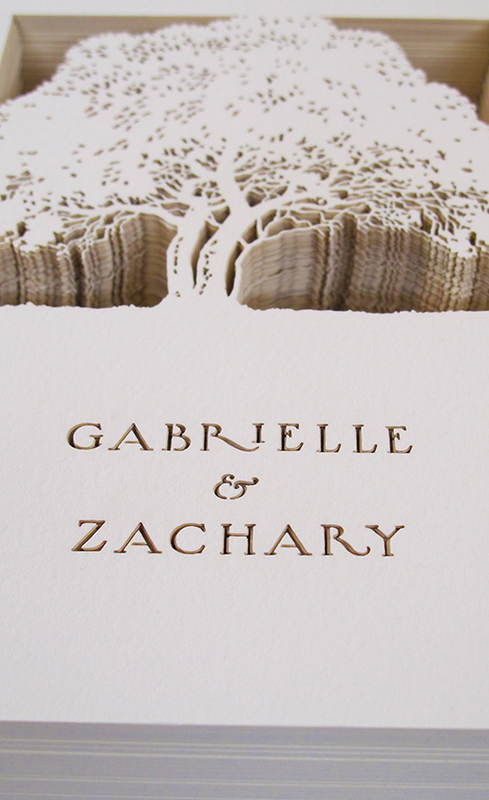 In June, that perfect project appeared, Gabrielle and Zachary’s wedding invitations! I’ve known Gabrielle for years and it was wonderful to work with a bride that I knew and adored. She wanted something simple and elegant with a nature element, she also suggested trying to bring in some subtle Japanese touches, as Zachary is half Japanese. This is the front of their invitation! 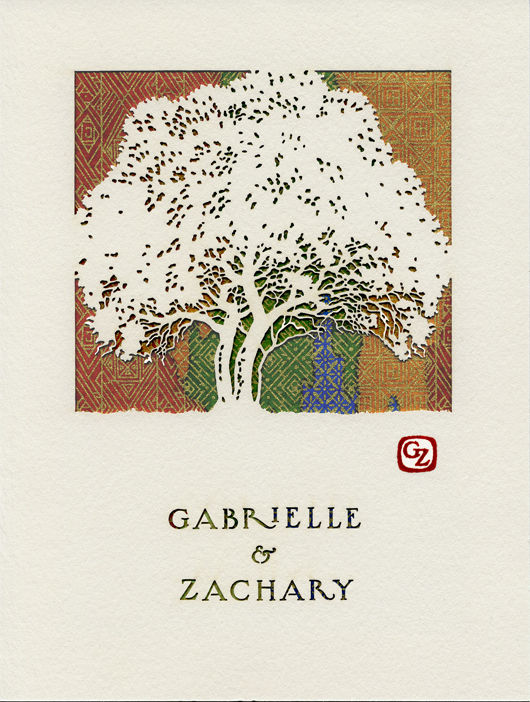 I knew the moment Gabrielle told me that she and Zack would be married under an enormous California Buckeye that the tree would be the central part of the design…. 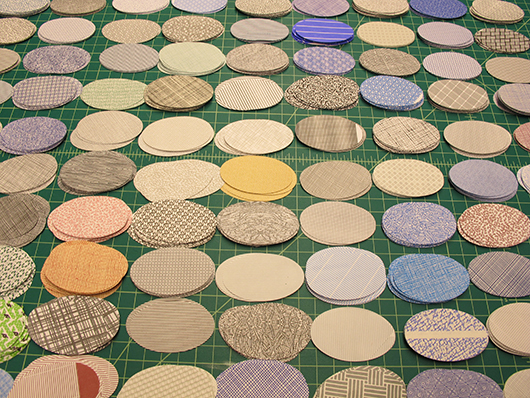 and perfect for laser cutting! It was still a challenge creating/designing an image for a technique I had no experience with. The approach was so different than creating a traditional illustration. And this is where I need to thank Scott Vogel, Scott is not only very experienced in laser cutting, he is also a graphic designer. It was wonderful and educational to work into someone who understood where I was coming from and spoke my language. 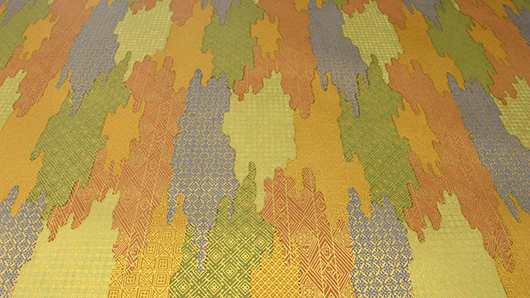 This is the traditional Japanese paper that Gabrielle picked out to back the laser cut invitations with. 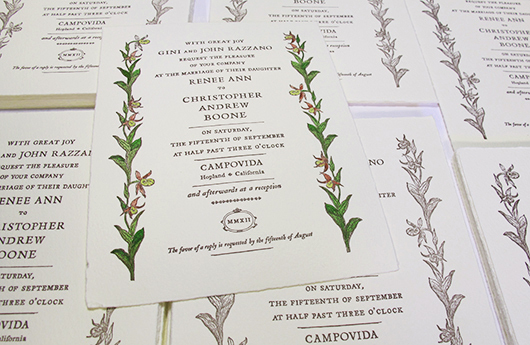 The palette was perfect for her outdoor fall wedding in Bolinas, California. I love the delicate gold line work, it adds such elegance. 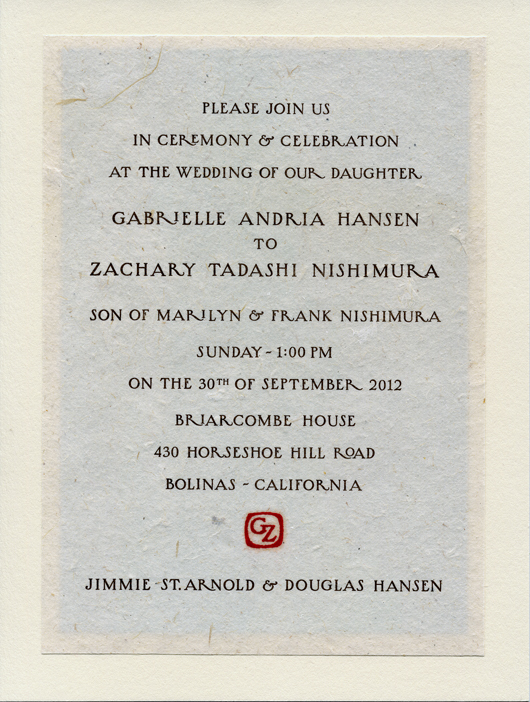 Here is the back of the invitation. 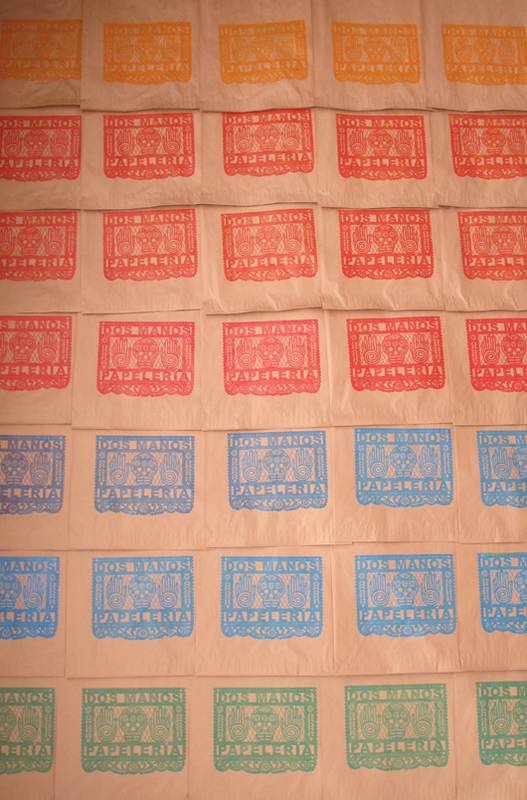 I found some beautiful handmade Japanese paper to letterpress print the wording onto. 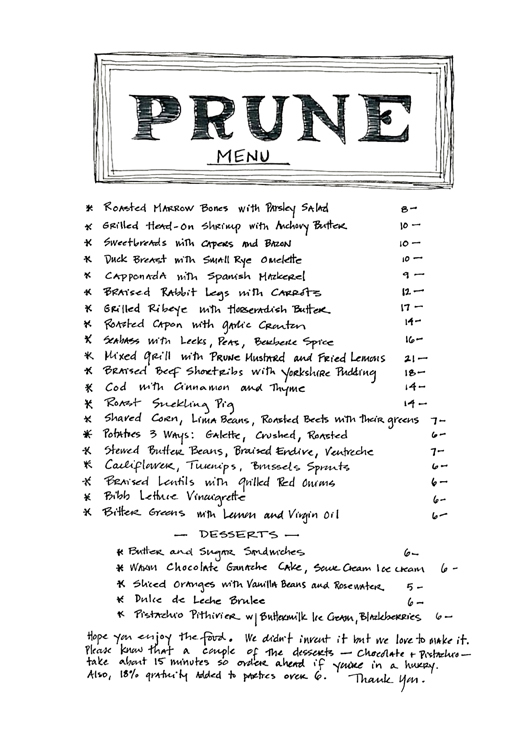 I hand-lettered the wording in a graceful style reminiscent of the 20′s. 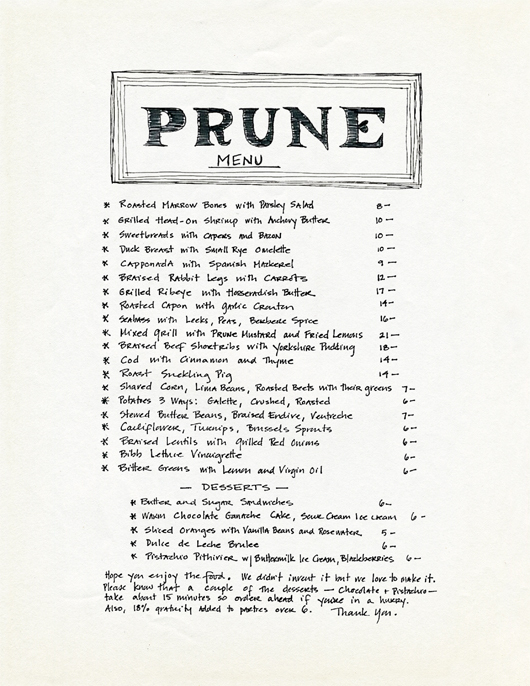 I love the playful, reaching curls on the “R”s. 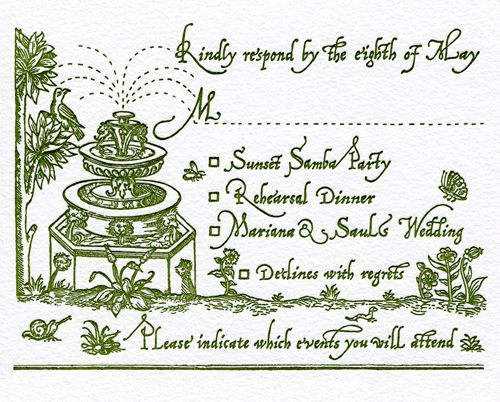 Here is the RSVP card and envelope, along with an information card. 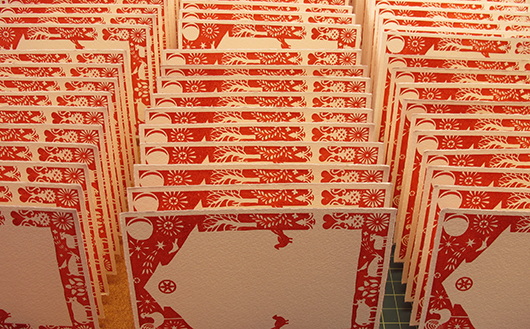 These secondary cards were kept simple with a single Buckeye leaf laser cut in the corner. 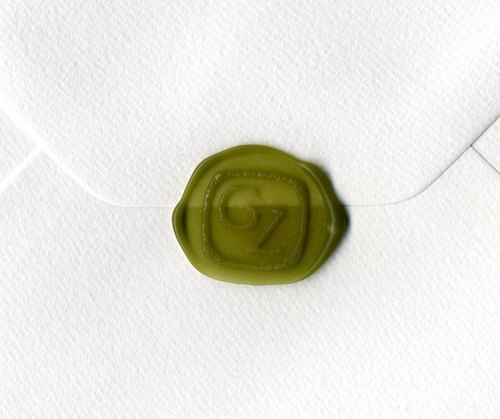 I designed a simple chop/seal using a “G” and “Z” and had a rubber stamp made. 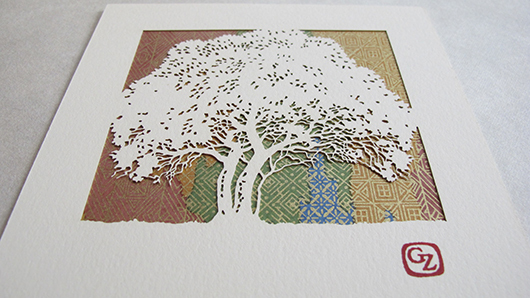 The seal was hand-stamped on several of the pieces which added another subtle Japanese touch. I found these first class Bonsai stamps online, so perfect for mailing this project! Along with the rubber stamp, we also had a custom wax seal made in the same design. The envelopes looked so beautiful sealed with such a personal touch. 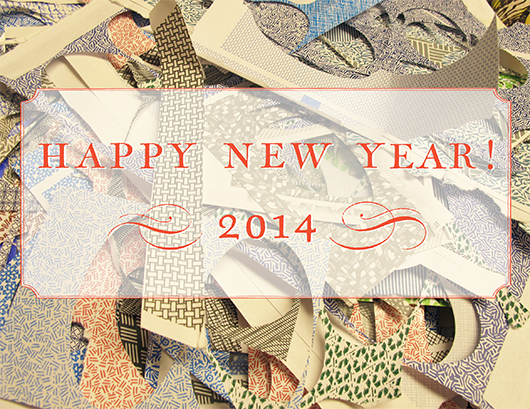 Now that I’ve seen my illustrations and designs laser cut my mind races with the possibilities for future projects! I’m so happy to have had the opportunity to use this technique and I can’t wait to experiment with it again. Today I’ve decided to write a very personal post. I realize this may be a bit inappropriate for a blog about my design projects and the way I work, however, I would feel uncomfortably strange to not mention the great loss I have recently suffered. On August 13th I made the decision to put Lola, my dog, down. It was the hardest thing I have ever done. 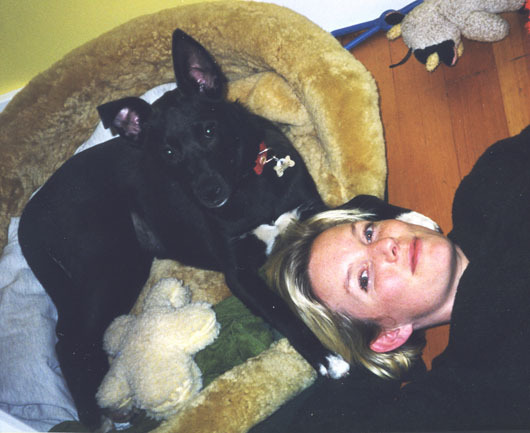 Lola was my first… I had dogs growing up, but this was different. my first true love, the child I will never have, the best companion one could wish for. (odd maybe, but I wanted to keep some of her beautiful fur). 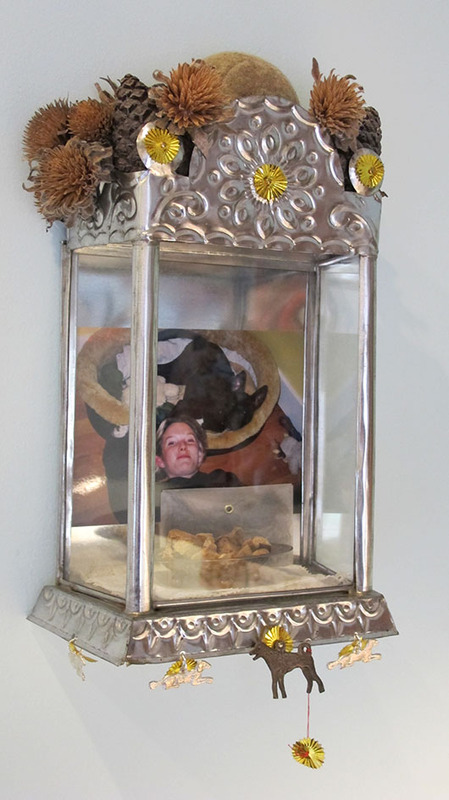 I’ve attached little Mexican dog milagros, dangling from the bottom edge, and crowned the shrine with one of her beloved tennis balls…. mud and all! 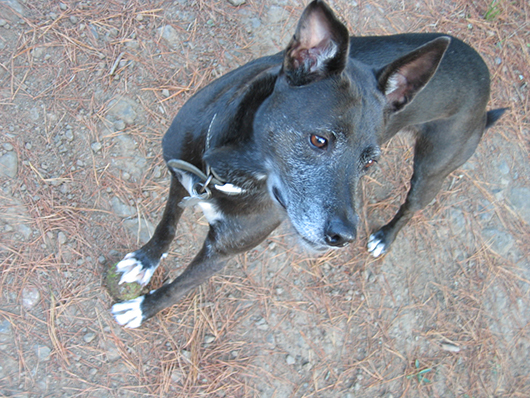 The dried flowers and pine cones were collected on my first hike without her…. it felt good to bring something back from our favorite trail in the Berkeley hills. My home and studio feel so different, and even a little foreign, without her comforting presence. Losing her has been very painful, but it has also reminded me of the consoling and healing qualities that come from creating artwork that is from the heart. Today would have been her 14th birthday. I plan to take a walk in the hills with my boyfriend, Marc. I’m sure we will find something beautiful to add to her shrine.